Joyce Mujuru is nothing without President Mugabe! 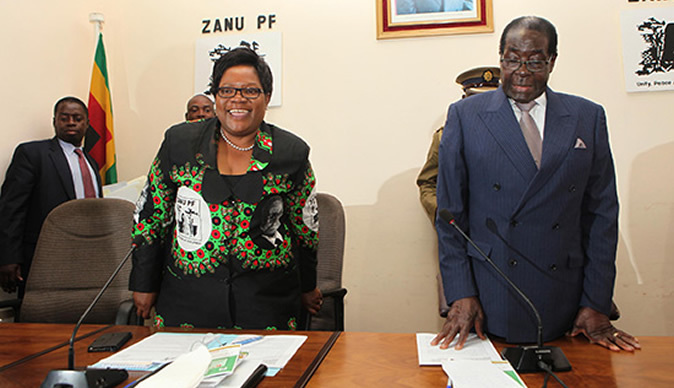 ZIMBABWE – The legacy that Joyce Mujuru enjoys today was earned while riding on President Robert Gabriel Mugabe’s back. She literally swung on the liberation icon’s coat tails. Without this legacy Mujuru is nothing. This practical reality contrasts sharply against the findings of the NCK Research Unit, an appendage of Oxford University, which revealed that Mujuru is the best opposition leader in the country at the moment. All her political prominence was gained under the guardianship of her mentor, President Mugabe. Her political leadership prowess is not tested outside the Zanu-PF Government where all her legacy is hinged on so far. The validity of this research by NCK is questionable on the actual criterion that was used to come up with such conclusions, considering the fact that she is not a leader of any political party in this country. It seems NCK is a sensational alarmist organisation that is poised to taking speculations as facts. Mujuru can be perceived as any other heavy-weight that left Zanu-PF with intention to make a difference on the political landscape. Examples that quickly come to mind are Edgar Tekere, Simba Makoni, Dumiso Dabengwa and Margret Dongo. These gained fame under the stewardship of Zanu-PF and were denuded to political dust-bins. Their relevance and possible contribution to national interest was rubbished by the electorate which denied them the vote. This is another circus on the making with Mujuru being the ridiculous main event. During her tenure of office in the Zanu-PF Government, Mujuru was a mole that worked closely with US administration, especially during the era of the former US Ambassador to Zimbabwe, Christopher Dell, whom she had secret meetings with as disclosed by the wikileaks. In that vein, possibly, there is a strong conviction that the west has a hand in creating its own puppet in her since she indicated that she is a willing mule that can assist to accelerate its regime change agenda in Zimbabwe. It is this grain of mis-direction which makes her persona-non-grata on the local political front. The electorate is on the touch-line awaiting to give her a red card if she throws the hat in the political ring sooner or later.